Look at these two dice. If you add together the numbers of dots on them, the total is $2$. 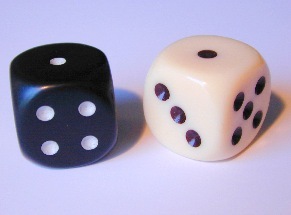 When you roll two ordinary six-faced dice like these and add together the two numbers, what results could you get? Do you have more chance of getting one answer than any other? If so, what is that answer? And why? 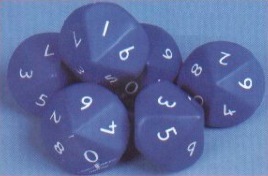 What if you use a dice with $10$ numbers on, like these? What answers could you get now? Now try with more dice or a mixture of dice. What do you notice now? Multiplication & division. Interactivities. Combinations. Dice. Visualising. Theoretical probability. Working systematically. Addition & subtraction. Factors and multiples. Investigations.